CX Network takes a look at some of the customer experience trends forecasted to take hold in 2019. 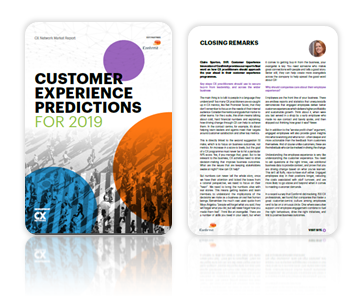 Whether you are closing off your strategy discussions for next year or just opening the waves of communication to discuss 2019 CX budgets, consider CX Network’spredictions in your game-plan for the 12 months ahead. We base our predictions on industry research and in-depth conversations with senior practitioners and customer experience specialists so we can give you a strong list of contenders. The trends tackled were selected by a base of over 200 customer experience specialists. These focus areas include the likes of proactive customer experience, trust, emotional engagement and the secret to moving established programmes past the dreaded CX plateau. Almost 20 customer experience specialists from around the globe provided in-depth analysis on these predictions– including experts from Bupa, Confirmit, BNP Paribas, Hootsuite and more! Download this exclusive report to access the foresight needed for a successful yearso you can stay on top of the trends and challenges making waves in customer experience strategies.